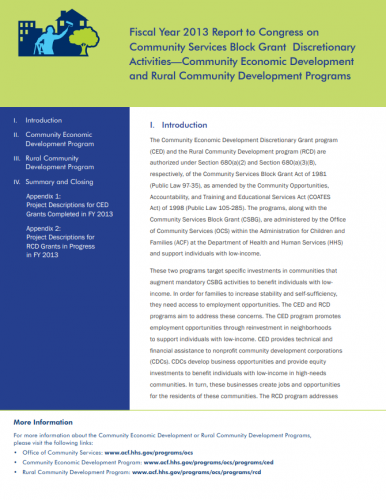 This report provides a summary of the accomplishments and activities undertaken by the Community Economic Development Discretionary Grant program (CED) and the Rural Community Development program (RCD) in 2013. These programs are administered by the Office of Community Services (OCS) within the Administration for Children and Families (ACF) at the United States Department of Health and Human Services (HHS) and support individuals with low-income. The report also provides a complete description of all CED and RCD grants that concluded in 2013. These two programs target specific investments in communities that augment mandatory CSBG activities to benefit individuals with lowincome. In order for families to increase stability and self-sufficiency, they need access to employment opportunities. The CED and RCD programs aim to address these concerns. The CED program promotes employment opportunities through reinvestment in neighborhoods to support individuals with low-income. CED provides technical and financial assistance to nonprofit community development corporations (CDCs). CDCs develop business opportunities and provide equity investments to benefit individuals with low-income in high-needs communities. In turn, these businesses create jobs and opportunities for the residents of these communities.